Back in October last year in the AT Closed Board Meeting a item called the Northern RTN Strategic Case was mentioned, its reason for being closed “to protect information that will soon be publicly available”. Me being ever so patient, I waited for the report to be released over the coming months, once this didn’t happen I decided the LGOIMA it. Recently AT released the report in detail which can be found here. A large portion of the report was dedicated to the importance of making sure that improvements to the RTN are aligned with the potential future Additional Waitemata Harbour Crossing (AWHC), either included as part of the crossing itself or at least so a road crossing doesn’t make difficult or even prevent necessary RTN improvements. This makes a lot of sense. Another point to note is that this report was completed prior to the completion of ATAP, which confirmed the AWHC as not being needed as early as previously assumed and pushed it back to the third decade, although route protection should continue. One of the great parts of the report was this graph showing what the models predict for future patronage crossing the harbour bridge every morning compared against trends over the last three and ten years. This shows the potentially huge underestimation of PT demand by official models we’ve talked about on many posts in the past. The document confirms what we had already suspected, that the Busway was originally predicted to provide capacity well until the 2040s will now realistically be at breaking point in the 2030s, with some sections, such as in the city centre, already under strain. Current peak-period bus volumes exceed functional capacity already in 2016 at the City Centre end of the busway and at Constellation Station. Capacity problems are somewhat reduced by 2026 due to implementation of bus infrastructure improvements in the City Centre. However, Albany Station experiences capacity problems. By 2036 operating bus volumes that are sufficient to cater to forecast demand mean significant over-capacity operations in the City Centre and at Albany, Constellation and Akoranga Stations. By 2046 capacity problems exist at all major North Shore Stations and in the City Centre. The most visible part of the busway is where it has its own dedicated infrastructure next to the motorway between Constellation and Akoranga. But it seems even that will be feeling pressure within one to two decades. Limited capacity, slow travel speeds and variable travel times for the missing segment of busway between Constellation and Albany. Inadequate size and capacity of Constellation Station to accommodate a large volume of bus services and passenger demand. “However, by 2026, the joint AT/ NZTA Northern Corridor Improvements (NCI) project is anticipated to have completed the missing section of the busway, constructed a new Rosedale Busway station and provided and additional platform to Constellation Station, therefore improving these deficiencies, capacity problems are somewhat reduced by 2026 due to implementation of bus infrastructure improvements in the City Centre, however, Albany Station experiences capacity problems. However, by 2026, a significant improvement in city centre bus infrastructure has been assumed. These interventions, while still conceptual in nature and subject to funding commitments, these upgrades are still constrained by signals at intersections. As such even in 2026, soon after implementation the city centre infrastructure is likely to only just provide sufficient capacity to meet demands. Nevertheless, by 2026, increased patronage on the busway and busway stations is likely to manifest in over capacity conditions and poor operational performance at Albany Station due to large volumes of commencing services in the AM peak which use up a lot of station capacity. Sunnynook Station which has the shortest platforms of all the busway stations will also be experiencing over capacity conditions affecting dwell times. Akoranga Station is also starting to experience congestion by this time. By 2036, performance has degraded further at the above stations, whilst Constellation and Smales Farm are now also expected to experience over capacity conditions affecting operational performance (i.e. dwell times). all City Centre corridors and termini are likely to be under sustained pressure in peak times at between 102-108 per cent of capacity. This is likely to lead to degraded performance, with dwell times becoming more variable, increased bunching of buses and accumulation of passengers at stops congesting footways. It is in by this time period that the performance of the busway is likely to no longer be to an acceptable RTN standard. What this means is we are starting to have capacity issues now. Improvements to infrastructure such in the city centre & extending the busway to Albany as part of the Northern Corridor project will only just be able to meet demand over the next decade or so. That could of course be even sooner if the Busway continues to exceed expectations. By 2036 the system will start to resemble the congested motorway the current busway runs alongside and by 2046 the whole Busway will have broken down. So, we may need a full North Shore RTN not by 2036 but by 2026- however ATAP doesn’t have this until 2038-2048. Nearly all the growth the growth across the Harbour Bridge is projected to be PT going from around a 1/3 of mode share today, to well over half by 2046. 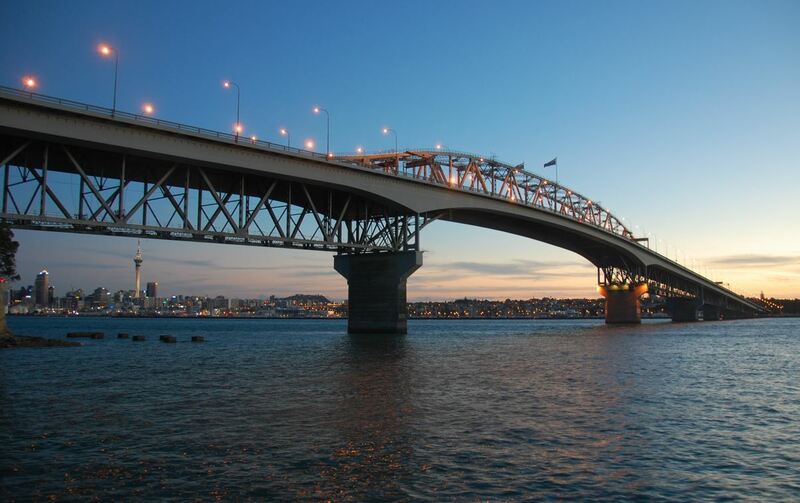 At present, around one third of all trips on the Waitematā Harbour crossing are public transport trips. By the mid- 2030s public transport demand exceeds general traffic and by the mid-2040s public transport is forecast to be the dominant mode on the Waitematā Harbour crossing. The report also shows that nearly all of the increased demand across the Harbour during the 30-year period is to the City Centre & City Fringe, with very low numbers increasing further south of the City Centre. There is also some increase in car demand across Upper Harbour. This is another black mark against a road based AWHC as it means a new, $3.7+ billion, six-lane vehicle crossing makes little sense, especially compared to a cheaper, RTN crossing. This is more evidence that a road based AWHC is a sub-optimal solution for the area, with nearly all growth in demand across the harbour being on PT, and towards the City Centre & Fringe. Trying to serve the demand towards the City Centre & Fringe, where road capacity is already stretched and not realistically able to be increased, with an expensive road crossing makes zero sense. While the report mentions that by 2036 Northern Busway Services will deteriorate to the point the service is no longer RTN standard, realistically by 2026 a new PT crossing may be needed even if needed CBD Bus Infrastructure is brought forward. That’s because if growth continues like it has recently, are we so certain the busway will be able to cope between 2026-2036. The last point I would like to make on the report is that once again PT solutions reactive, it is not until they have broken down from over-utilisation that better PT is considered. We need to change to a more proactive view where we see PT investment as being an agent for transformative city improvement, instead of waiting till the last possible minute. Separating out the transit and road crossings is vital, not just from a timing perspective but also a physical one. As I understand it, if tied in to a road tunnel, any rail tunnel would be very deep after it separates from the road tunnel making connections to existing networks difficult. Sort the missing modes first, transit and active mode only bridge please. The existing studies looked at motorway crossings. The discussion above is about a PT only crossing. Its s very different proposition. Admittedly I’ve never seen it v in person but I’ve heard that the golden gate Bridge is beautiful. It is indeed. It’s almost biblical. Beautiful design, fantastic setting, and a mesmeric joy to drive over. Never feel like that in a tunnel. Best thing to have in a tunnel? Trains. Fast. Speedy. Dark outside. Read a book. Done. It is, however I’m not sure how impressive it would look with the existing Auckland Harbour Bridge sitting next to it! Bridges are often beautiful… I disagree that a new bridge will be an eyesore. The current bridge is a very poor example, but a Light Rail/ Active bridge could be a very light and elegant structure, and have the great advantage of being in front of the current one! Skypath will indeed be great, but I’m confident that there will certainly be plenty moredemand for more cycling and walking connections once it’s open. Anyway that’s not for me or you to decide and is separate from the more important issue that it’s clear that a Rapid Transit crossing is what is needed next and that it would be very unwise to get it delayed, more expensive, and less optimal, because it’s being forced into being part of a road crossing that is less and less useful or likely. These very different projects need de-coupling now; now matter how much, at first glance, it might seem that doing them together make sense. It doesn’t. Bridges can’t be beautiful? Sure they can, and they’re often some of the most powerful symbols of a city. Even Auckland’s half-arsed Harbour Bridge is something of a symbol. Ones like the Golden Gate Bridge, London’s Tower Bridge, any number of bridges in Paris and around the world can be beautiful and connect two parts of a city much more fully than a tunnel ever could. IMO the big question is ships. What’s the largest ship the Waitemata harbour needs to take? Are the big ships that prompted the harbour bridge still required or have the facilities they met closed/changed to smaller ships. Wouldn’t you just make any new bridge as tall as the current one? No, it would be a waste of money building that high if it is not necessary. The original bridge is 52m high to allow clearance for ships to sail to the proposed port at Pollen Island. That of course won’t happen now as it’s a marine reserve. The only current user with large ships is Chelsea, I have no idea what their rights are in terms of access but I imagine they would relocate if a bridge was built that their ships couldn’t pass under. Don’t forget the Navy that still use Kauri point. There are several other things in the harbour where you would want reasonable clearance, including Chelsea, the naval armaments depot at Kauri point, Westharbour marina, boat builders at hobsonville and greenhithe. The of course there is Westhaven Marina and the superyacht base on the western side of Wynyard. Depending on exactly where you put your bridge, you would effect some or all of that too. Personally I think it is a non issue. Any bridge anywhere would need to be at least 20m clearance for simple yachts, its not like you could get away with a sea level causeway or viaduct. The difference from that to 50m clearance isn’t huge. Compared to the cost of a tunnel, it’s still probably half the cost or less. From memory the highest clearance under the Upper Harbour bridge is 17m so it certainly couldn’t be lower than that. Good points about Kauri Pt and Westhaven. Incidentally wikipedia says the AHB is 43m, not sure where I got 52m from. AT just needs to get on with it. Build a rail tunnel now (LR or HR, doesn’t matter). For too long, the council, its related subsidiaries and the government have mucked around on building major transport infrastructure before existing networks like the busway hit capacity. According to this article, nearly all the growth in going over the harbour is in public transport (the busway), so stop looking at overpriced useless motorway connections and give the North Shore a great rail line. If we don’t get this done now, it will MUCH harder in the future to secure land and modify existing infrastructure to make it happen. Nathan the problem is with any transport project of scale is that the government controls the process and, most importantly, the purse strings. AT would love to get on with a great deal of things by itself, but it can’t. And there’s the other problem: the government. The government that somehow managed to delayed the CRL for years (now its not fully opening till 2023). The government that chucks billions at NZTA to fund useless motorways in Northland (Puhoi-Wellsford, Marsden Pt-Whangarei), among other places. There needs to be a shake-up on how transport projects are funded and who designs and builds them. Which organisation decides whether to trade-off road vs rail? NZTA builds roads. It is what they do. NZTA don’t build railways, or should they? Which part of Government makes the trade-off for the benefit of the people? Treasury and Ministry of Transport would be closest, however I’m not sure how much influence either has on the National Land Transport Fund, which is where a large portion of this money comes from. Ultimately it rests at the political level. So in theory, with the people. However current policy does not match survey responses at all. The people are clearly less highway mad than this government, but whether this is gap is sufficient to lead to a change of government anytime soon is very hard to argue. Very few people vote primarily on transport at government elections. Ironically we do at local level, but local gov can’t make these decisions…. So Gov it seems can keep denying AKL the right to even tax itself more to pay for things without, probably, much risk. People will probably keep blaming AT/AC for the lack of a train or quality bus, which govt won’t fund or allow Council to fund…. Although it’s true that the govt dragged its feet in agreeing to the City Rail Link, this probably didn’t have much effect on the opening date. The council, thankfully, was proceeding full bore with the planning and design while the government dithered. As far as I can tell, the main reason why the CRL will be finished in 2023ish rather than 2019 or earlier, as initially advertised, is just that it’s a highly complex project and it has taken that long to get all the ducks in a row before construction started. Now wouldn’t it be good if AC/AT went full bore with the planning and design of a proper rail tunnel based AWHC while the govt and NZTA dither about with their bus nonsense. Dgd the boring doesn’t start until much later. East west link or Rail from the city centre to Orewa? Please let’s get this in the media!!! Hell yeah, bring that sucker right into Orewa! I also agree that a bridge might be the better option (multi-modal – rail, cycle, walk) and if that money saved speeds the project up all the better! That being said I still think that we do need to think Long Term (something NZ doesn’t seem to know about) rather than just medium term. Long Term (possibly even medium term) LR will also struggle with capacity (especially if it is just replacing buses on the the NEX). 1) What happens to the NEX while it is being converted to LR? With it already being busy and only getting busier any construction on the NEX is going to cause huge disruption! Best case scenario if they did this would be to close one lane in sections at a time and install flush rails so that when complete buses can still use it. Of course LR would need to be the kind with power supply built into the surface rather than overhead otherwise DD won’t fit in underneath. 2) Personally I would like to see a whole new RT line built (probably underground) up the Shore that complements the NEX rather than replacing it. There are areas of the Shore that aren’t serviced by the NEX (Birkenhead/Glenfield/Greenhithe/West Albany, as well as Coastal). Now if it is being built underground then the cost difference between LR and HR is minimal so better to go for the higher capacity HR to provide long term capacity. Ideally it should continue all the way through to Silverdale/Orewa and then at some stage in the future possibly through to Warkworth. By complementing the existing NEX then that allows the NEX to be used by a variety of buses (including shuttles etc) doing different routes as well as providing the extra capacity and of course redundancy in the event of an issue with the LR/HR line. 3) Cost – yes a new line would be expensive – so would a road AWHC and rail would provide a ton more capacity (especially if it complements the NEX – would also help resolve some of the intra-Shore transport issues). Long term, real long term, then yes it is likely that a full high capacity limited stops semi-interregional North-South rail line will be needed, like the RER in Paris, or CrossRail in London. But there’s nothing about a more local access rail system that either precludes that or is made redundant by it. They would complementary. Near term needs must be met however; enhancing the busway, and medium terms too; replacing/upgrading the busway to rail, then, in decades it comes time to consider the next step. I completely agree with your proposed construction method, though there is some potential to build some sections (Akoranga to Smales) by closing the busway and running on local roads in bus lanes. Converting is an issue, but we seem to do all manner of motorway changes, upgrades and rebuilds without shutting down the state highways. Surely it’s quite doable, buses can drive around things and on temporary links quite easily. I wouldn’t be so hard on the capacity of light rail, if they pick the right system it could have as much capacity or even more than other rail systems. Take Dallas for example, they have eight lines coming together on one two-track section, and run 24 LRVs an hour in total, each of which is a “super LRV’ that they now run in 110m long triple consists with 600 people on board. That’s almost 15,000 people an hour each way, about what the CRL will max out at. Whoever put a linear extrapolation of three points on Figure 6 should have their name put on the graph so we can laugh at them. It’s one of four trend lines on the same chart, so clearly they’re not confident in any one prediction about the future. People who live in glass houses shouldn’t throw rocks. Even if “poor”, that linear extrapolation over 3 data points would be no less accurate than all the half-arsed wild-arse-guesses that “harbour bridge traffic is going forever into the blue sky” traffic projections NZTA and MoT have continuously made and remade over and over for the last 16 or so years. Especially as many of these bridge traffic prognostication exercises are used as primary evidence to justify why the AHB is due to infarct any time about now so we need that new crossing for cars and trucks ASAP. And yet every single one of those is completely optimistic and out of date within 1-2 years. We don’t get boards of enquiries about those poor projections do we? Maybe those guys who came up with those should be putting their names to those predictions so we can all laugh at them and their stupid follies though as you suggest. Or are you washing your hands of those predictions too ‘cos you only build the bomb not drop it? Guilt by association in the world of Greg N.
Auckland Transport and NZTA needs to stop heavily investing in more roads and needs to start investing heavily in public transport. Build a rail crossing already. Does not matter if its bridge or tunnel… just build it! NO TO BUSWAY! I also think a bridge is the best option. We are not Sydney with over 8 million people. We built an out of date and unsuitable bridge from day one. Time we put it right and build something practical and obviously something more easy on the eye. Sydney doesn’t have 8 million people either to be fair. Sydney 4.9 million +/- 100k. It is rapidly growing but we all know how much Aussies like to exaggerate. That is for Greater Sydney including close by satellite towns. You could say Auckland is about 1.6m so 1/3 the size of Sydney. One difference is that when Sydney was Aucklands size it had about 3x the rail network that Auckland has now. Two track faults in the last two weeks at Britomart during evening rush hour, a signal failure at Pukekohe leading to cancellation of all trains… What’s the point of a rail tunnel under the harbour when they can’t keep the tracks in a fit sate to run trains over them? There is nothing wrong with the signals at Pukekohe, there is however an issue with the building the signalman has to be in to operate the signals. Out of interest: Is this the only place in Auckland where the signals are controlled like this? Done mainly in Wellington isn’t it? There are not many place in the country left that still have an onsite signalman and it is the only place on the Auckland metro network. So is it likely this local signal control will be removed to Wellington when the Pukekohe station is redeveloped? The platforms, footbridge (not the new one) and building look pretty much on their last legs so the new station construction can’t be far away. It is only a matter of time before the local controls are closed and moved to Wellington like the rest of the network just don;t expect OLE to be installed any time soon. Please do NOT wait for the last possible minute. This entrenched attitude has persisted since the days when Robbie’s rapid rail was poo-pooed down the gurgler. He was RIGHT all along wasn’t he? But history aside, it is wonderful to see this dialogue with AT going down. So hopefully the bean-counters can find a way to make it all happen as it should.